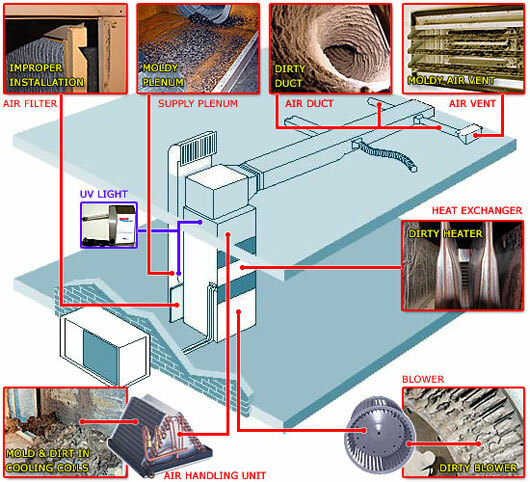 Why Should I Get My Air Duct System Cleaned? Just as a mechanic regularly flushes a car’s engine to keep it running efficiently, cleaning your home’s heating and air conditioning (HVAC) system can lead to cleaner air, better performance, and lower energy bills. Watch the NADCA guide to properly cleaning HVAC sytems. Air duct system cleaning allows systems to run more efficiently by removing debris from sensitive mechanical components. Clean, efficient systems are less likely to break down. They also have a longer lifespan and operate more effectively than dirty systems. every two years. Things like pets, pollen, dust, renovation, and nearby construction can drastically affect the amount of dirt entering and clogging your home’s air delivery system and possibly aggravating respiratory health issues like allergies or asthma as well as affecting your system’s overall efficiency. Over time, dust and debris build-up on components of the system and if not cleaned, greatly decrease its overall efficiency. These contaminants significantly decrease air flow, resulting in your furnace or air conditioning unit consuming more energy to provide the desired level of comfort. Having a clean air flow system can increase efficiency up to 30 percent! Contact us for a free, no obligation price estimate.